World-class theatre, cutting-edge architecture, great shopping and virtually every type of cuisine under the sun… There’s a lot to love about Toronto. In this vibrant and extraordinarily clean city, the locals are friendly and the vibe laid back. Book a holiday to Toronto with lastminute.com and you’ll get the best deals on flights and accommodation. Disabled city breaks in Toronto provide wheelchair users with so much to see and do. 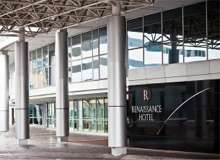 The Renaissance Toronto Downtown Hotel is located inside the Rogers Centre and offers full-service luxury accommodations. As the only hotel in the world situated inside a major league sports venue, the Toronto hotel's 70 field-view rooms make it a unique destination. Located just steps away from the Metro Convention Centre, CN Tower, Air Canada Centre and the city's bustling financial district. 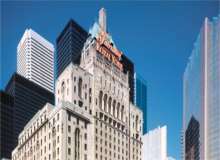 Standing in the very heart of downtown Toronto, The Fairmont Royal York luxury hotel provides all of the facilities and services one would expect of a world-class city. In any of our five superior restaurants and four lounges of our downtown Toronto hotel, guests may savor sumptuous cuisine and famous cocktails. After a day of sightseeing or business meetings, guests can relax in the spa and fitness center. The Westin Harbour Castle Hotel is located on the vibrant waterfront of Lake Ontario and features refreshing accommodations in Canada's largest city. Take your family for an adventure and explore all of the things to do in Toronto by Lake Ontario or check out nearby attractions such as the CN Tower or Hockey Hall of Fame. 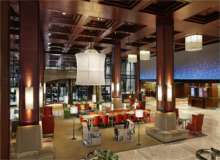 The Westin Harbour Castle Hotel is the perfect option when visiting Toronto. 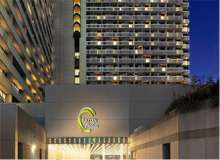 The Sheraton hotel is perfectly located near all of Toronto's attractions and connected to the financial and entertainment districts by way of the PATH, a 16-mile underground network of shops and services. Also, during your stay enjoy shopping, Mirvish Toronto theatres, world-class dining at downtown Toronto restaurants, and Toronto museums are steps away. Be at the center of the action when you stay at the Hilton Toronto hotel in Ontario, Canada. 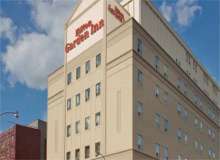 Located in the heart of downtown Toronto's entertainment, fashion and shopping district, close to Union Station, this Toronto hotel is connected to the PATH system, the city's downtown underground pedestrian walkway. Centrally located within walking distance to the city's subway as well as the thriving business and shopping districts, Eaton Chelsea, Toronto offers travellers efficient and comfortable accommodation in the heart of the city. Eaton Chelsea offers guests a broad choice of dining venues. Experience all-day dining at Market Garden, enjoy fresh local dishes at Bb 33 Bistro and Brasserie, indulge in a coffee or cocktail at the T|Bar Lounge or embrace the lively vibe in Monarchs Pub, downtown Toronto's hotspot for nightly entertainment. Come discover why bigger is better at the Courtyard Toronto Downtown, the largest full-service Courtyard by Marriott hotel in the world. The amenities are endless, and the service is personable. Located near notable shopping in Bloor-Yorkville and Toronto Eaton Centre, our downtown Toronto, Ontario hotel is in perfect proximity to an assortment of entertainment, businesses and transit options. Relax at Hilton Garden Inn Toronto City Centre. Set in the heart of downtown, this hotel in Toronto puts you in walking distance of shops at Toronto Eaton Centre, free concerts and art exhibits at Dundas Square, and performances at Ed Mirvish, Winter Garden and Massey Hall Theatres. Visit Ryerson University across the street or the nearby Bay Street and Financial District. 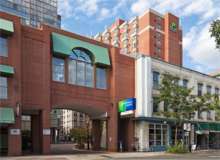 You'll enjoy an ideal location at the Holiday Inn Express Hotel - Downtown Toronto. 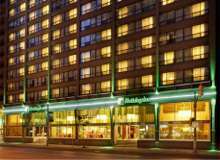 The hotel is located near Pearson International Airport (YYZ), Toronto Island Airport (YTZ), Toronto Union Train Station and the underground shopping/walking paths, which makes it easy to navigate Toronto. 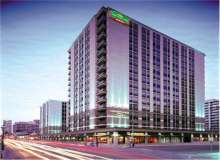 Bordered by Yonge, Carlton, Church and Wood Streets, Holiday Inn Toronto Downtown Centre is in the centre of it all. Some of the finest shopping venues in the world such as the Toronto Eaton Centre, the shops at Yorkville, Holt Renfrew, The Bay, Winners, Marshall's and Bed Bath and Beyond are only minutes from our doorstep.